Queerspace Magazine is a web magazine that tells queer stories that are equitable and just, celebrating the humanity and upholding the dignity of people whose voices deserve to be heard, but aren’t. Video is a highly effective communication tool, especially on social media sites such as Facebook. Twitter, Instagram, and others. Jetspace Studio can help you create the perfect video for your campaign, presentation, or advertisement. 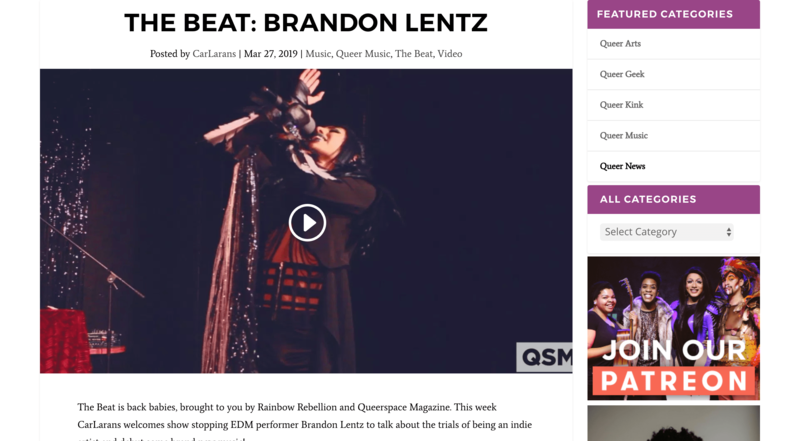 These are a few examples of videos we produced for Queerspace Magazine. These videos were shot in studio or on location, and edited in Final Cut Pro with titles created in After Effects. Want us to shoot your video? We can handle everything from storyboarding and concepts to animation and special effects! As Queerspace Magazine has grown, so have their marketing efforts, including a recent appearance at a large Seattle convention. This required the design and printing of both business cards for Queerspace Magazine contributors and a 4’x6′, double-sided postcard as a convention booth takeaway. The business card uses design cues from the website, while retaining a clean, simple design and layout. The postcard also uses design cues from the website, as well as photos from Queerspace Magazine events to display the website audience. Queerspace Magazine is our sibling site, so building their website was definitely a labor of love. This site is a web magazine, built from a customized WordPress template, including customized widgets, and site graphics. The site is responsive, built with mobile in mind from the ground up, and heavily features embedded video.